Warm fluffy sweet rolls made with dried cranberries and raisins. 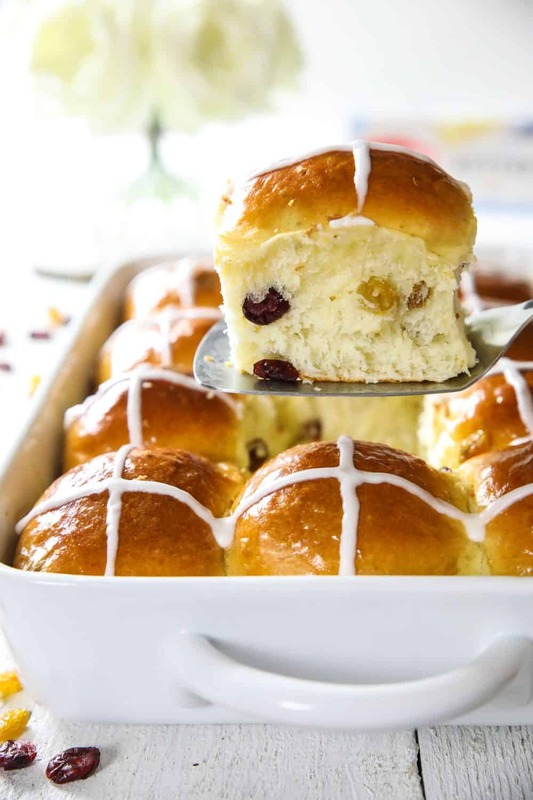 Serve this brioche hot cross buns recipe toasted with salted butter for an Easter morning treat! This recipe is a similar but sweeter version of my brioche bread and brioche burger buns recipe. A huge thank you to Darigold for sponsoring this amazing recipe! This post may contain affiliate links. Read my disclosure policy here. First, combine the flour, salt, and sugar into the bowl of your stand mixer. Next, pour in the yeast mixture, eggs, and vanilla extract. Now, mix the dough on high speed and add the softened butter. Keep mixing the dough for about 10 minutes to really incorporate all that butter throughout the dough. You’ll want to use the hook attachment for this step. Now, place the dough into a large greased bowl and let it rise (covered) for about one hour. Next, separate the hot cross bun dough into 12 brioche buns and place them in a baking pan to rise and bake for 25 minutes. After the hot cross buns have cooled, pipe out the icing on top. 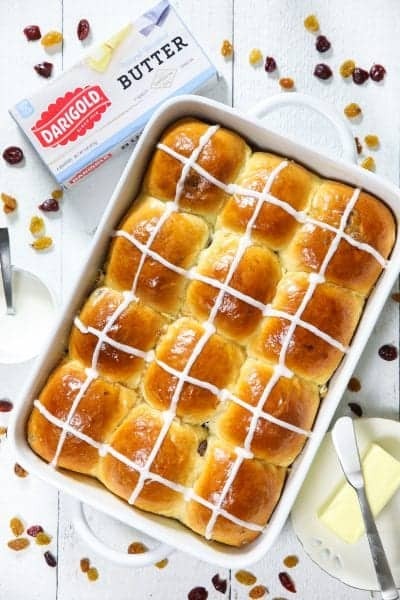 What ingredients go into hot cross buns? Well, these hot cross buns are just like any basic hot cross buns, they just contain a little extra butter for the ultimate fluffy texture. The most common ingredients in hot cross buns are flour, yeast, sugar, salt, butter, eggs, dried fruit, and spices. Hot cross buns are a type of spiced bread usually containing some sort of dried fruit or raisins. Although they can be enjoyed any time of the year, they are typically eaten during Easter time. They are always iced with a cross pattern over each bun to represent the cross of Jesus Christ. How to eat hot cross buns? Typically, Hot cross buns, especially this brioche version is best served warm (toasted) and sliced with salted butter on top. Looking for more Easter recipes? Give these a try! Roasted leg of lamb– perfect main dish dinner idea! Couscous and arugula salad– Light, spring flavor. Carrot cake– loaded with carrots, pineapple, and cream cheese frosting. Nutella Brioche– warm yeast dough with swirls of melted Nutella in between. Brioche Buns– great for burgers or slow-cooked meats. Warm fluffy sweet rolls made with dried cranberries and raisins. 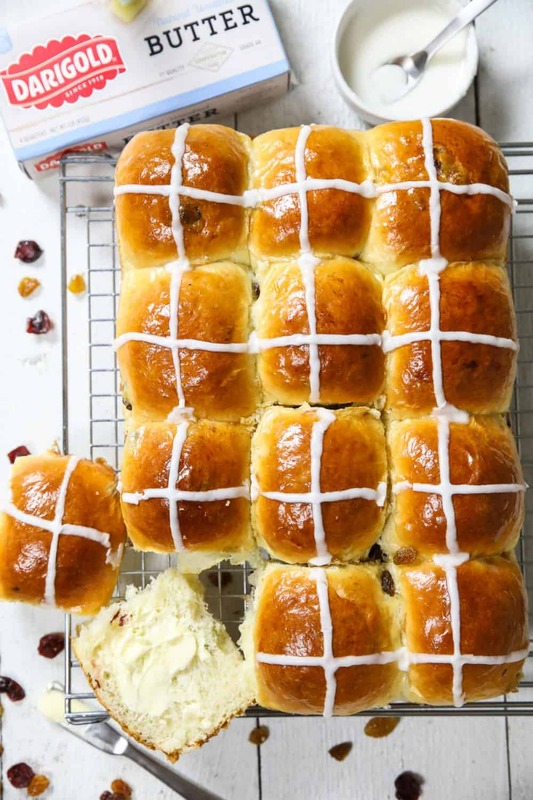 Serve these brioche hot cross buns toasted with salted butter for an Easter morning treat! Add Half a cup of golden raisins and half a cup of dried cranberries into a bowl. Now fill the bowl with boiling water and let the submerged raisins sit for about 15-20 minutes. Now warm 3/4 cup milk to 110 degrees Fahrenheit. Then add 1 tbsp sugar and 1 1/2 tsp of dry active yeast. Give it a quick stir and set it aside for about 15 minutes or until it becomes frothy. Meanwhile, add 3 1/2 cups of all purpose flour into the bowl of a stand mixer. Then add in 1/2 cup of granulated sugar into the bowl. make a well in the center of the flour and pour in the yeast mixture. Lastly, you’ll add in 3 eggs, 1 tsp vanilla extract and I almost forgot the salt. You’ll need about a pinch of salt. Now using the hook attachment start off by mixing all the ingredients on low speed until the flour begins to incorporate into the wet ingredients. Now pick them Speed up to high and mix until no more patches of flour appear. Now you’ll add 3/4 cup unsalted softened butter to the dough and continue mixing on high speed for about 10 minutes. Depending on the size of your eggs you might need to add another 1/4 cup of flour. The dough may seem too sticky at first but be patient, continue beating and it will begin to take shape. During this process, you may need to scrape down the sides of the beater bowl with a spatula to pull away any butter that may have stuck to the side of the bowl. 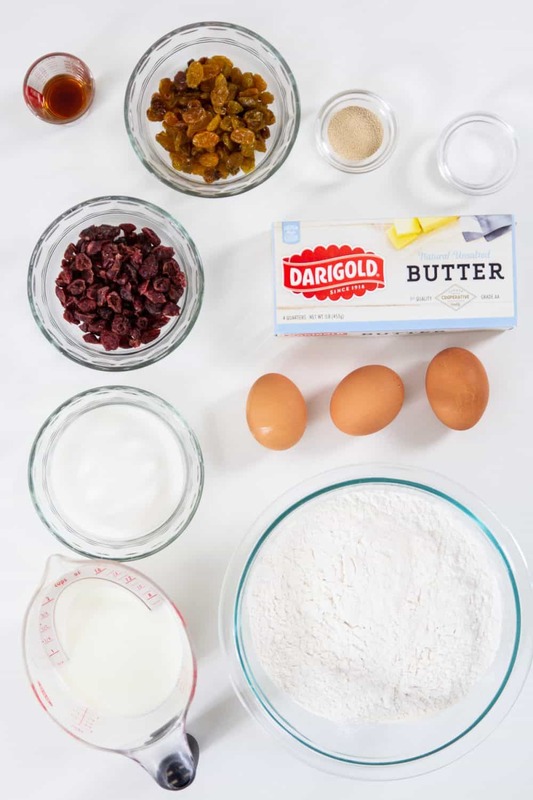 Now drain the soaked raisins and dried cranberries and add it to the dough. You’ll want to mix these in for about a minute or so pretty much until they’re well incorporated. Now you can remove your dough from the mixer bowl and begin working it into a ball. The Dough should still be sticky but firm enough to work with. That sticky texture is from all the Incorporated butter. Which will soon be fluffy layers of bread. Place the dough into a large greased bowl and cover it for about one hour or until doubled in size. Now shape the dough into a log and divide it into 12 equal pieces. Take each piece of dough and shape it into a ball with your hands. Then place the shaped buns into a deep baking dish coated in non-stick spray. Now cover the buns with a kitchen towel and let them proof for about 1 hour. Once the buns are done rising brush them with egg wash and bake at 350 degrees Fahrenheit for 25 minutes. Meanwhile make the icing by combining 1 1/4 cup of powdered sugar with 3-4 tsp of milk. You want the icing to be slightly runny yet thick enough to pipe out and not spread out. Once the buns are baked and cooled, pipe out the icing In a cross pattern over each bun.